Does the Fable III Box Art Confirm a PC Version? Fable III could show up on PCs after all, judging by what is reportedly the game's leaked box art. The image you see here is reportedly the Fable III box art as obtained by MCV UK. Notice anything particularly interesting about it? Well, other than the fact that it looks much nicer than the box art of some other games, that is. How about up on the top, just right of center? The text there reads, "Only on Xbox 360 & Windows." 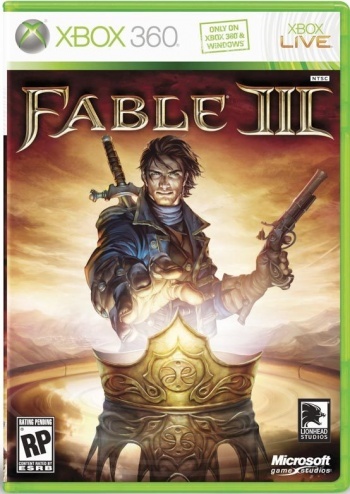 This is particularly curious, because if you look at the Fable II box art, it says "Only on Xbox 360." This little snippet of text has many speculating that Peter Molyneux's latest venture into Albion will be finding its way to the PC platform instead of just consoles. It's an interesting situation, to be sure: The first Fable was on the PC, but the second game was an Xbox 360 exclusive. Was the exclusivity, then, something that just didn't work out - which is why they've apparently gone multiplatform with the third installment? Given the similarities between coding for the Xbox 360 and Windows-based PCs, it does make sense to make your game available to a wider audience. Of course, this isn't confirmed by any stretch of the matter. Fable III is still a few months away, and it's possible that the image you see here was just a mock-up that somebody threw together while forgetting to remove the "& Windows" bit. Fable III could well be a console exclusive after all. VG247 contacted Microsoft on the matter, and was told that while no announcements had been made, to "please stay tuned." Stay tuned, hmm? Like, say... for a month from today at the Microsoft press event at E3?